After you move out of the dorms and into the apartments, you no longer have the luxury of having meals prepared for you. After a day of class, it's definitely hard to even plan a decent meal, much less prep and cook one. Eating out or whipping up a microwave meal can seem like the easy way out. At the same time, there's almost nothing I love more than a homemade meal. 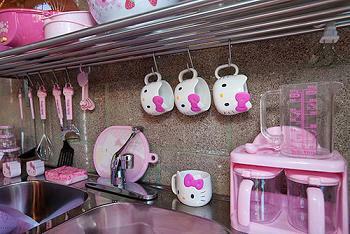 That's why I love fun kitchen accessories and gadgets that add a bit of motivation to get me cooking! Whether I need to time how long to leave something in the oven or how long to marinate certain meats, a handy little timer that's cute to boot is the cherry on top of the ice cream sundae. Or in this case, it's the strawberries on top of the adorable cupcake timer. Craving weekend brunch? 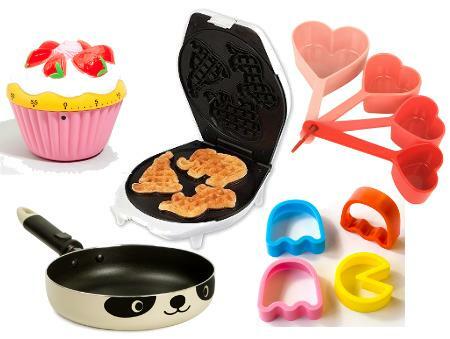 This waffle maker whips up waffles in no time in the shape of circus animals! Add a couple sliced strawberries, a bit of whipped cream, and some maple syrup (or Nutella) and I could not be happier when it comes to breakfast. Measuring cups in the shape of hearts just makes it seem like I'm putting so much more love into my cooking. And who doesn't want food made with love? Perfect for a morning sunny side up or a Chinese dinner stir-fry, this adorable panda skillet is almost too fun to use. Looking at its cheery panda face would definitely make me smile as I chop and drop in some delectable vegetables. Cookies are already delicious, but cookie cutters just make them more fun! If you're up to it, you can even decorate these Pac Man cookies with cookie frosting so that they look like the game characters! How do you motivate yourself to cook?